The Van Etten Library Book Club discussion group is a forum where readers can come together and talk about books and the reading experience. It is interesting to note that each member usually has a different perspective on the selected reading material. Sometimes everyone loves the selection; other times maybe only one or two members love the book. Sometimes everyone agrees that the book was not what they expected at all. It all depends on the subject matter and each individual reader’s interpretation. The Book Club members meet monthly on the last Friday of each month from 12:15-1:00pm. 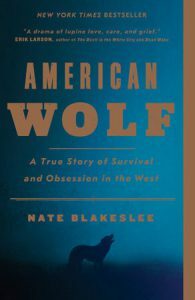 This month the Van Etten Library Book Club members selected “American Wolf: A True Story of Survival and Obsession in the West”, written by Nate Blakeslee. This selection is a non-fiction story about an alpha female Yellowstone wolf named 0-Six, named after the year she was born. An interesting fact is that 0-Six can be found throughout social media platforms as she had many followers worldwide (I found her on YouTube). The Book Club alternates from fiction to non-fiction book selections to keep things educational at times, inspirational at times, and light-hearted at times. If you are interested in joining the Book Club, please feel free to stop by the Van Etten Library on the last Friday of the month, or call 607-589-4755 to get the next title that the group has chosen to read and discuss. Everyone is always welcome to suggest a title, whether fiction or non-fiction. Hope to see you soon! This entry was posted in Van Etten and tagged book club, Van Etten by ccld. Bookmark the permalink. Next → Next post: Check out The Great Courses from your library!